Some Odd Girl Stamps Winter Friends & Colouring Tutorial! This month Kristy, the artist and owner of Some Odd Girl stamps is having a celebration. 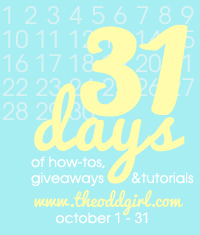 In honour of her 31st birthday, this month there are 31 days of tutorials, how tos and giveaways. There’s lots going on, and you can join in now over on Kristy’s “The Odd Girl” blog. Today is the 10th day, so make sure that you scroll back through and check out the previous posts in this event! I’m thrilled to be helping celebrate again this year. Last year I posted some colouring videos, which you can check out >HERE<. This year I’ve created a little step by step on colouring a festive night sky. For the step by step info, you will need to visit my post over on The Odd Girl blog. But before you hop over there, here’s my card! That’s it! Hope you enjoy the step by step and perhaps find it useful. This entry was posted in Cards, Tutorials & Videos and tagged Graphic 45, Make it Colour Blending Card, MFT Die-Namics, Shinhan, Some Odd Girl, Some Odd Girl Stamps, Touch Twin, Touch Twin Markers on October 10, 2012 by Elaine. Oh Elaine that sky is flippin amazing! Very topical with the northern lights as they are visible in yorkshire at the minute 😉 STUNNING effect and brilliant card! This is so adorable, I love the background you created with this cute image. fabulous colors. PS: Thank you for your lovely comment, you have made my day:-)! Gorgeous coloring, Elaine. Your tutorial was great. I love how you added texture to the bears fur. Awesome.